I adored the 2.0 Litre rev-happy engine, I really did. 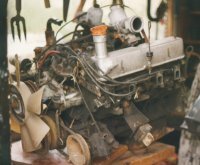 Lotus mullered the Vauxhall based engine and the 4 valves per cylinder didn't half kick in at 4 000 r.p.m. The trouble was that the engine I'd bought, as has been previously explained, was not exactly in pristine condition. Every now and again 'interesting' noises would emanate from the engine - you know, the kind of noises that make you sweat. The kind of noises that, when you take it in to your friendly mechanic, elicit a pursed lip, shake of the head and the comment "Well I can do it, but it'll be 25 hours labour, plus the parts - and there's the V.A.T. on top. 'Course I can do it cheaper for cash, but I'd need it up front. Tell you what, I've got a nice cheap reliable runner out back if you trade this one in for a pound - and I'm robbin' meself at that....guaranteed for 5 miles or 5 minutes, whichever comes first"
Of course when you first embark on this kind of project, everything looks rosy and bright. You don't anticipate all the problems you're going to encounter (at least I didn't - this was shiny, gleaming, bright white virgin territory for me). So what if the engine had hay all over (and in) it? A quick rebuild and it would slot into the Lotus just fine. After all, I'd read up on it all, asked some advice; I'd even seen a few conversions at places like Donington and it didn't look that hard. I mean, come on, it's only nuts and bolts isn't it? Day 8 - Allow for any unforeseen problems.